The Carmel Indiana Lincolnshire neighborhood has a peaceful and personal feel that only a small community can provide. With just 82 home sites, Lincolnshire residents have the opportunity to truly get to know one another – whether it’s a friendly chat on one of the Carmel neighborhood’s walking trails, or during a social hour at the neighborhood swimming pool and cabana. Lincolnshire offers new construction homes by Estridge, a popular and well-respected Carmel builder with a good reputation for quality homes and neighborhoods throughout the Indianapolis area. 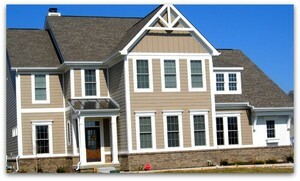 Anderson Hall in Fishers is another beautiful Estridge new construction community! Designed to give buyers a custom home feel without a custom home price tag, Lincolnshire homes feature standard luxury details, finished lower levels, and interesting architectural elements. Neighborhood amenities include a pool, cabana house, picnic area, playground, walking trails and plenty of green space.